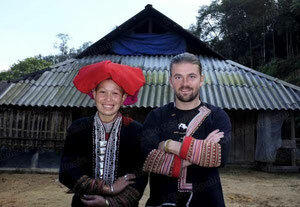 The Homestay - Maison d'hôtes traditionnelle à Sapa : Chez Xi Quan. Our homestay is our pride. It was built in 2011 following traditionnal Dao architecture. We added 2 rooms for the guests to stay : a room has 1 bed while the other one has 2 beds (maximum 6 guests.) We also have in-house toilets rather than outside ones as some local homestays choose to do. Last but not least we have a nice balcony with a view over the mountains where you can enjoy a coffee in the morning. Since we are located 45 minutes away from the others homestays you will only find nature and calm at our place. What is better than waking up with the sound of a small river and the birds in the morning ? We do however have electricity (using a water powered turbine) so that you can recharge phones and cameras during your stay with us. Our little organic garden located behind the house allow us to grow delicious veggies that you can enjoy for dinner or lunch. We like to grow chilies, bell peppers, tomatoes and pumpkins mainly. You might want to try a herbal bath also. This is a very special bath usually taken after childbirth by Dao women. Up to 30 kinds of plants can be used to create this unique remedy. The barrels are hidden so that you can enjoy privacy during your bath.